This year is about to come to an end, how was your 2016? Do you improve, get better, achieve your goals and reach for what you want this year? If you have accomplished all you have set out to accomplish this year, congratulations and 2017 will be another great year for you. If you fail to achieve most of your goals and are not accomplishing much this year, it is perfectly alright. I want to let you know that 2017 is not going to be the same because your past does not have to be the same with your future. If you fail right now, it does not mean that you are going to fail again in the future. If you try something a moment ago and it did not work out, it simply means that it did not work out a moment ago. All you need to do is to try again. And you can improve your method or try something a little bit new. This is how successful people did it. They do something and if it fails, they try more and they change their approach. They keep doing it until they succeed. So let’s make 2017 one of your best years ever. If 2016 is a lousy year for you, let’s change that. Let’s make 2017 a great year. So where should we start? The best starting point is to start with your goals. I know that you already know what you want to achieve and what you should do to achieve them, the challenge is in the execution, not the ideas. Most people fail to achieve their yearly goals because they give up somewhere along the line. They started strong and with motivation, but somewhere down the road, they get lost, lose faith and their motivation started to wane. Therefore, if you can maintain your energy and motivation throughout the year, you will greatly improve your chances of achieving your goals. The key is to maintain your momentum and keep your eyes on your goals until you reach them. 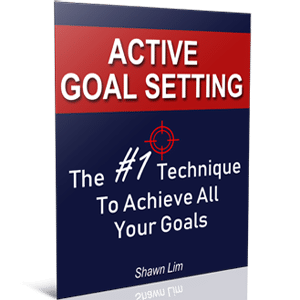 I know you have heard about goal setting gazillion time. And I know you know that your goals should be stated in the positive, you should write them down, you should include a deadline, etc. However, one thing most people never do is to set their goals every day. Why should do you set goals each day? The answer is simple, you want to program your goals into your subconscious mind and keep your eyes on your targets. You see, most people get it wrong and thought that goal setting is a one-time work. They write down their goals once, and they never look at them again. No wonder their motivation wanes and they started to get distracted and lose direction. You should practice daily goal setting. Writing down your goals every day is just like practicing the fundamentals for professional athletes. Do you think Usain Bolt knows how to run? Of course, he did, but he still wakes up each morning and practices the fundamentals. What about professional car racer? Don’t you think they know how to drive the car already? But they still practice driving the car and getting themselves familiar with the tracks every single day. The same goes for every professional athlete. If you want to get better at something, the only way is to keep practicing the fundamentals. And in your case, and mine is to practice daily goal setting. Write down your goals every single day. And this is what I do each morning right after I wake up. Do you know Scott Adams, the guy who drew the Dilbert cartoon? It is said that he writes down his goals and affirmations as much as 15 times every single day. No wonder he is successful. You should do the same. Every morning right after you wake up and before you get to work, write down your goals. Start your day with a clear direction in your mind so that you can proceed and accomplish more each day. I first came across this powerful technique from Robin Sharma, the best-selling author for “The Monk Who Sold His Ferrari”. Sir Robin said that if you want to move forward and achieve great things in life, all you need to do is to focus on taking five small steps each day. If you can produce five small victories a day, within a year, you will have achieved 1825 small victories. And do you think that these 1825 small steps will get you somewhere? You better believe they would. In fact, all successes start somewhere. Every master was once a beginner and everyone started somewhere. You can use this technique to achieve your goals in 2017. All you need to do is to aim to take five little steps each day. You don’t want to overwhelm yourself with work until you get paralyze. The key here is to maintain your momentum by getting small and consistent work done each day. If you follow this strategy, after a year, you will definitely accomplish much more than you ever imagine. This method is easy to do. Get yourself a calendar and every day you have achieved your big five, put a big red “X” on the date. And DON’T BREAK THE CHAIN. Keeps the big red “X” going on. Every day once you have taken five action steps that will move you toward your goals, put a cross on the calendar. This method is powerful because it is easy and simple. Anyone can do it and it doesn’t require much of your time. More importantly, this method is able to measure your progress. Whenever you look at the calendar and you see a stretch of “X”, you know you are onto something. This will keep your motivation and confident high. So utilize your calendar with the Jerry Seinfeld strategy. Mark the big red “X” starting from today. First, you practice daily goal setting and start your day right. You know what you want and you make sure you are moving in the right direction. Second, you take at least 5 action steps each day. You are doing something consistently to move forward towards the things that you want. And third, you have to make sure that you will stick to your schedule no matter what. You see, the difference between ordinary and extraordinary people is that extraordinary people will take action and do what they need to do no matter if they feel like it or not. On the other hand, ordinary people do what they feel like doing. When they don’t have the motivation or when they feel sleepy, they tend to procrastinate and put things off. Do you think that Usain Bolt trains every day? What about Michael Jordan? These extraordinary people train every single day, regardless of whether they feel motivated to do it or not. You have to be the same. You have to take action no matter it is a good day or a bad day. You have to train yourself to be disciplined in taking action. And you have to make your schedule your habit. Success is about taking consistent action. So hold on to your goals and keep taking action. If you fail, change your strategy and try again. When you do something and you fail, it doesn’t mean that you are going to fail again the next time you do it. So keep trying until you get the results you want. Most people are not living their dreams because they give up somewhere along the line. They started strong and they took massive action. Unfortunately, their motivation did not last. When they don’t get the result they want at the first few attempts, they lose faith and they started to slow down. Eventually, they give up and forget about their goals altogether. This is why being consistent is important. And this is why you should stick to your schedule and follow your plan. Take action every day until you reach where you want to be. More importantly, never lose sight of your goals. So do you know why you want to write down your goals every day now? I hope you do. If you can follow these 3 surefire methods to achieve your goals in 2017, I’m almost certain that you will achieve them. So you keep your eyes on your goals each day. And then you take consistent action until you reach your goals. When you fail, you try something new. You keep on improving your strategies until you succeed. The only thing can go wrong is none other than the person putting this system to work, and that is you. Think about it, what happened to the goals that you did not achieve this year, in 2016? Did you lose sight of them? And do you act on them? Chances are high that after some time you have set the goal, you started to lose sight on it and got distracted. And in the end, you have totally forgotten about the goal and you never do anything to achieve it. Therefore, it is not your goals that don’t work. It is the person behind the goals that did not work. Of course, now you know what you should do to make your goals a reality, so make it happens. Apply what you have learned today into your life, and make 2017 a great year. Remember, never lose sight of your goals. And be consistent. Period.